Cuban Sandwiches- An Immediate Do! So I have never attempted to make Cuban food. Not sure why. It wasn't super popular where I grew up so I guess I never really thought about it before. We rock Mexican food all the time, but not many other Latin cuisines. Then, we watched the movie "Chef". And it totally changed our lives. For starters, once the kids are old enough, we're buying a food truck and just traveling across the country cooking. Also, it inspired us to try to make some Cuban food. And since the hubbs is all about a sandwich (and I'm all about making bread), we started with the Cuban sandwich. And I had a little help from Three guys from Miami. There is a shortage of blogs out there dedicated to Cuban food. But these guys seem to know what they're talking about. 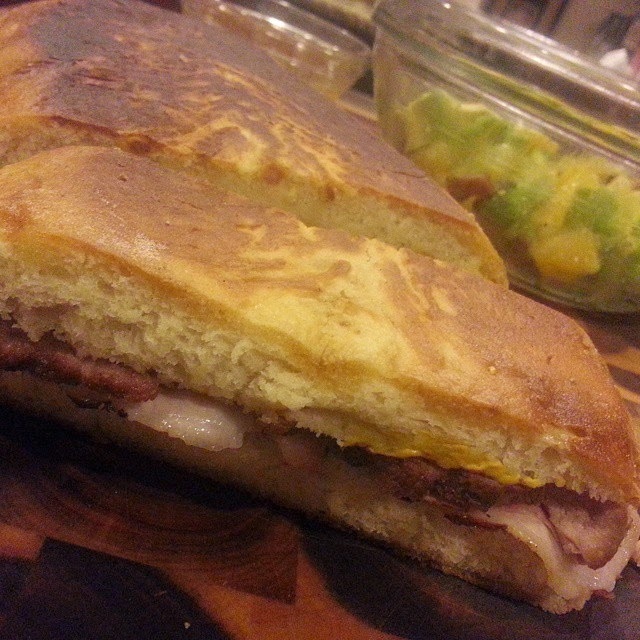 I used their recipes for the Cuban bread, the lechon asado, and the Cuban sandwich. I highly recommend all 3. So here's what I did a bit differently. The bread. OH MY GOSH THE BREAD. Hands down, the best sandwich bread (especially for a toasted sandwich) that I've ever eaten. And they are right. ALWAYS USE LARD. Always. It's hard to find a good lard- Whole Foods doesn't sell it for some reason. And our trusted butcher (now BB Ranch because Bill the Butcher closed) only sells it sometimes. This time they only had duck fat. It worked beautifully. Just bring on the fat. There are not enough words in the english language to describe this bread. But here's what I would do differently. I would not make one ginormous loaf. It was massive. I would break it into at least 3 loaves. The lechon asado (roasted pork) was also phenomenal. I used all the ingredients they said to (although I did use fresh oranges, limes and lemons instead of sour orange juice. I enjoy fresh squeezed). I did however cook it totally different. I of course did not read the recipe instructions before making it, so I missed the whole poke holes throughout the pork and let it sit in the marinade overnight piece of it. Oopsie. So I improvised. And let me tell you. Deliciousness happened. For starters, I stabbed the pork shoulder all over with a small knife like they say to. Then I hacked up the pork shoulder into 5 big chunks. There is flavor in the brown (thank you Carla Hall! ), and as many sides as can be browned, should be. So I threw some lard in a dutch oven, then browned on all sides each chunk of salted and peppered pork. Once it was all browned, I removed the pork, then started cooking all of the other ingredients. I softened the onions, I threw in the garlic, then added the juice and the oregano. I let that come to a boil and get all the bits of pork off the bottom of the pan, then I threw the pork chunks back in. I put that into a 225 degree oven and cooked that for about an hour and a half. Then I put it back on the stovetop and cooked a bit more. Once it was done, I took out all the pork, and I reduced the sauce that was left so it was nice and thick (warning, it gets saltier this way so don't go salt crazy in the beginning). This was a nice dipping sauce for the sandwich. Which is not in the recipe but I super heart a good dip. We bought some smoked ham from our butcher. And let me just say. I've always hated ham. So has the hubbs. It just is not a flavor I enjoy....although I love EVERY OTHER PART OF A PIG. But this ham? This ham was stupid good. We bought a crap ton of it because it was just. so. good. I've put it in my eggs basically every single morning since we purchased it. SO. GOOD. And we bought jarlsberg cheese. It's considered a baby swiss...a slightly milder flavor. I love a good, kick you in the teeth swiss, but the hubbs? Not so much. So we tasted a bunch at whole foods and that is the one we agreed upon. It still had some bite to it, but not so much that people in my house wouldn't eat it. And I will say that the pre-sliced swiss cheese? Just. Don't. It doesn't have nearly the same oomph. We bought a good ole hunk of cheese from the fancy pants cheese section and sliced it ourselves. You get more for your money, and you get WAY more flavor. You're welcome. We also did the yellow mustard and the dill pickles. Organic of course. We were a bit skeptical of the yellow mustard, which neither of us has eaten since we were approximately 8. But it totally works with this sandwich. And no, we don't have the special, Cuban sandwich maker but we do have a flat cast iron griddle and a bacon press, so we just used that. And the best sandwich in the history of ever was eaten that night. And the salad on the side you ask? It's orange slices, avocado, and bacon. With a little salt and pepper. It's amazing. I could eat this every single day of every single month of every single year. And I just might. I believe the idea came from a restaurant, then I saw a pic of it on a friend's Instagram. And I jumped on that band wagon real quick. And of course, as we made 2 1/2 pounds of pork, we had some leftovers. And since I'm not big on eating the exact same meal 2 nights in a row, I made a sorta dip out of them. And I'll be honest. I think I like the left over meal better than the original! I just cut up some peppers and onions, and threw them in a cast iron skillet with the pork that I cubed up, and some of that marinade, and added some gruyere. I got a little crisp on everything. 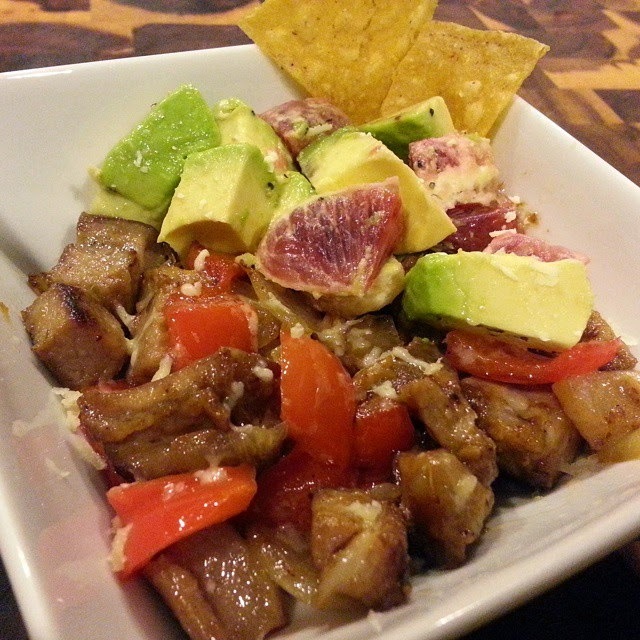 Then I threw it in a bowl and topped it with some blood orange slices and avocado slices. (I left out the bacon because the pork acted as that salty, fatty goodness the salad screams for). Then I ate this with tortilla chips. Seriously. This might be one of my favorite meals ever. And it's funny. What makes me SUPER HEART LOVE LOVE LOVE Cuban food is all the citrus they use. I'm a sucker for lemon, orange, and lime on any and everything. The hubbs? Not so much. He always calls me out on using too much. He obviously is wrong, of course. But I try to make food he'll like. Anway, you should make this immediately. So good. So worth it. And so trendy right now!